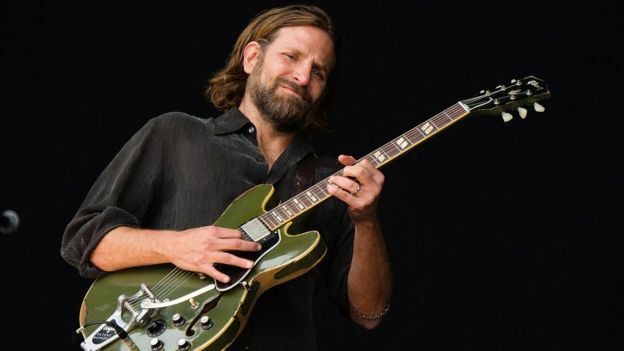 Bradley Cooper has paid tribute to the UK’s “magical” Glastonbury music festival, where part of his upcoming film A Star is Born was shot. “I didn’t want to make a movie about music without it being an element,” the actor turned director told reporters at the Toronto Film Festival on Sunday. Cooper, 43, surprised fans in 2017 by appearing ahead of Kris Kristofferson’s set on Glastonbury’s Pyramid Stage. Gaga plays a young singer who Cooper’s character takes under his wing in his directorial debut. Live performances at Glastonbury and California’s Coachella festival feature in the film, a cautionary tale about substance abuse and the price of fame. The film had its world premiere at the Venice Film Festival last month and has been hotly tipped to win Toronto’s influential People’s Choice award. “Kris happened to be playing so I asked him if I could take up some of his set,” Cooper said of his appearance at Glastonbury. “We had four minutes and it was unbelievable. “I spent four days there in all and learned so much about its inner workings. “It’s the largest privately-owned music festival in the world and it is the place that makes and rejuvenates careers. “What would be wonderful is if we intervene early when we see people struggling, both in the music industry and in life,” she said. A Star is Born marks Gaga’s first lead performance in a fictional film and features several live performances – a condition she insisted upon before agreeing to appear. “I wanted to be a vehicle for Bradley to tell this beautiful story,” she said, revealing she had shunned make-up and dyed her hair its natural colour to play rising star Ally. “I wanted to give it everything I had.